← Scritch Scratch Squoosh Screeeeam! 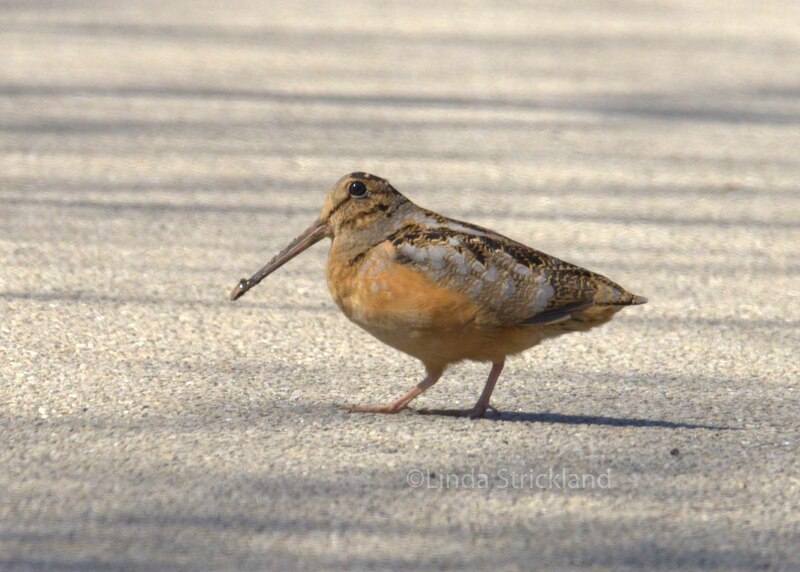 This woodcock was crossing the street soooooo slowly! And doing his mating strut. He would have been run over if we hadn’t stopped. He didn’t even care as we opened the car door, so intent was he on doing his strut! My husband shooed him to the other side of the road, finally he moved a little faster. Spring is definitely coming! Signs of it all over. Here’s a video of what he was doing. hehe! I loved it. When I found this video on U Tube I knew I had to share it, the music is so perfect. And this is really how they move. It was pretty unique! Thanks. Oh, Linda, this is precious. Thank you!!!! Thank you Amy. I’m just glad we got him off of the road! he did not understand traffic. What an entertaining video featuring nature! Thanx for helping us all share a smile. I loved the video too Sonel! hehe. It just makes me happy. Gosh, I think I’d get motion sickness if I had to move like that. So funny! !Thanks, Linda! Motion sickness for sure! hehe. Poor little one. He was driven by nature’s instincts. Eso Si Es Ir Asegurando Cada Paso… Sin Duda ALgo Que Nunca Había Visto… Un Saludo. You know it’s funny the things you see when you’re least expecting them. I was really looking for an owl! But instead I got this treasure. And I’m so glad we got this little guy off the road! And that I got to see his dance. I hope he found what he was looking for! hehe. Yes John! hehe. That song would have worked too.